‘Begin with the end in mind’ is not just a self-help rule*. It’s an effective guide to planning for impact. When we are ‘modelling change’ with an organisation or initiative, we get people to start with the change they want to see. Social and environmental change is complex. It’s changeable. 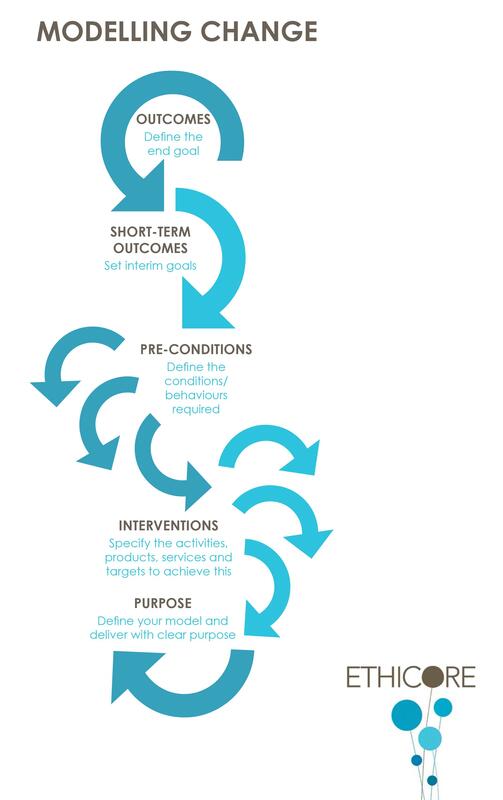 Focusing on the end goal and identifying the conditions for success from there helps define an organisation’s unique interventions with real clarity of purpose. This purpose helps people navigate through change and be responsive, while remaining on course to achieve the change they want to see. The beauty of this model is that it concentrates on your end goal, not what has gone before, encouraging you to apply fresh thinking and consider new routes to change. It will focus you on what people will need to do differently and your role in that: identifying the right interventions. The diagram shows the modelling change approach. Start with LONG TERM OUTCOMES: Ask yourself what is the goal/change you are seeking? For participants, beneficiaries, their communities, their services, their governments, etc. Now consider SHORT TERM OUTCOMES: Here you need to think about more immediate changes. What are the indicators of this outcome? Who or what is needed to reach this goal? How many of that group do we need to have to have to reach the goal? What level needs to reached— how good is good enough? By when? Next, move on to PRE-CONDITIONS: What conditions are necessary for you to achieve success? What behaviours need to change to get the impact you are after? Include your assumptions here. Only now get into your INTERVENTIONS: Your activities, products, services, advocacy. Align them with each pre-condition for a joined-up outlook. The additional benefit of this modelling approach is it will hone a clear, sharp message to communicate around your PURPOSE. Ultimately you’ll have a strong proposition which will feel more inspired, but also rooted in the reality of the work you do, the change that you can make that others can’t get close to. Aim to have ONE SENTENCE which talks to what makes you unique, it must be instantly memorable and believable. Test it on your stakeholders – if they don’t get it, refine it until they do. Of course this isn’t the end but the start of an iterative process. The most successful organisations are adaptive. Revisit your change model regularly, to refine and respond to external shifts. Be evolutionary in your thinking and you will be on a pathway for change for the long-term. *Stephen R Covey, Habit 2 of ‘The 7 Habits of Effective People’.